Word on the street is that Governor Walker has already promised private contracts to UnitedHealth Group to administer services to elderly and disabled people under Wisconsin's Family Care and IRIS programs and facilitated by county Aging and Disability Resource Centers (ADRCs), all of which are targeted in the proposed state budget for privatization. I'd been previously hearing that the insurance industry giant Humana would likely be in line for at least some of these contracts. As the public outcry in opposition to these budget proposals intensifies, it's worth noting the appearance of insider dealing in the governor's office. The governor's chief of staff was a top executive at UnitedHealth before joining the administration. If legislators go along with the changes Governor Walker is seeking, seniors and disabled people in need of assistance will have to phone in to a privately run call center instead of being able to meet face-to-face with a benefits specialist as they can now. And they will be at the mercy of private, for-profit companies like UnitedHealth or Humana when trying to access needed services. All the more reason to ‪#‎fixthisbudgetnow‬. This is where way too much of our health care $ are going. 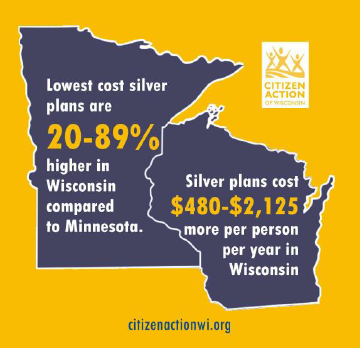 "Thanks to the watchdogging of Greater Minnesotan Health Care Coalition, which has consistently pointed out the failure of our state government to control the spending of the HMOs to which it outsourced our government-subsidized health programs. The HMOs continue to make hollow claims that they are cost-effective in delivering health care, and they have tricked the Legislators into believing that they have been completely accountable in how they spend our tax money. But numerous government investigations into the deceptive and non-transparent labyrinth of accounting for how patients are treated always show that the HMOs remain non-accountable to taxpayers; meanwhile, HMOs extort more and more money each year. HMOs are deficient, not efficient. They are a disgrace to Minnesota.